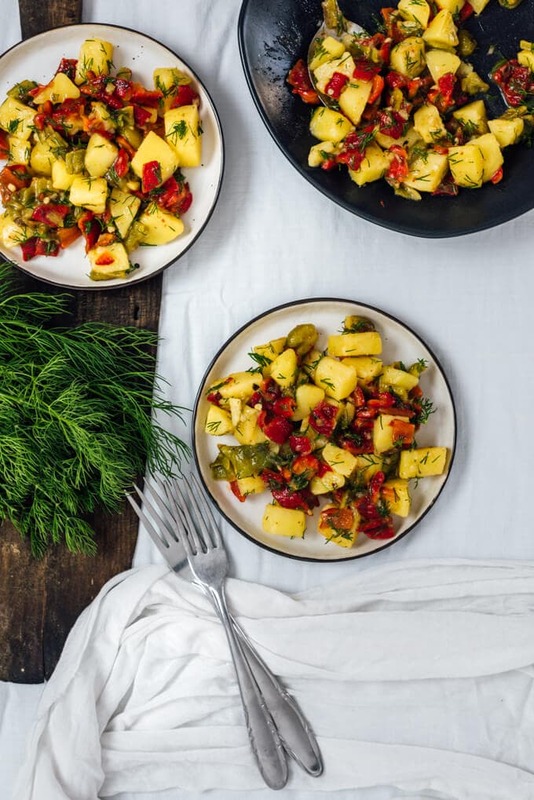 This tangy Roasted Pepper Potato Salad without Mayo is so good that it is a big hit at barbecues and summer picnics. You won’t miss your classic recipe once you taste this one. Who doesn’t love a good potato salad as a side dish? It is a staple not only at potluck parties but also at big family dinners. I’m not talking about creamy potato salads which is loaded with mayonnaise. No. This is a mayo-free potato salad, which makes the recipe a part of our No-Mayo Salad Recipe Series. We mostly enjoy a potato salad with hard boiled eggs as in this Turkish Potato Salad. On the other hand, I sometimes want something new. Do you have the same feeling? 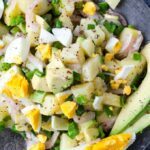 Give this Potato Salad without Mayo a try if yes! I got the idea of this recipe at our latest picnic by the lake in our town. Besides beef and meatballs, we always grill eggplants, red and green bell peppers to make a roasted vegetable salad. We added some boiled potatoes to the salad that day and it matched perfectly. I knew I would work on it at home to improve the taste even more. I roasted the peppers on the stove for this recipe, but you can use the oven as well. If you don’t have any experience about making it at home, you can read this detailed article How to Roast Bell Peppers and choose your own method. Do you know the easiest way to remove the skin of roasted peppers? Put them in a pan, let them sit covered for 5-10 minutes. Then remove their skin using a piece of paper towel. In addition to roasted red and green peppers, freshly squeezed lemon, garlic and fresh dill are the ingredients that went into the same bowl. Oh I almost forgot! A good quality olive oil is a must for this recipe. 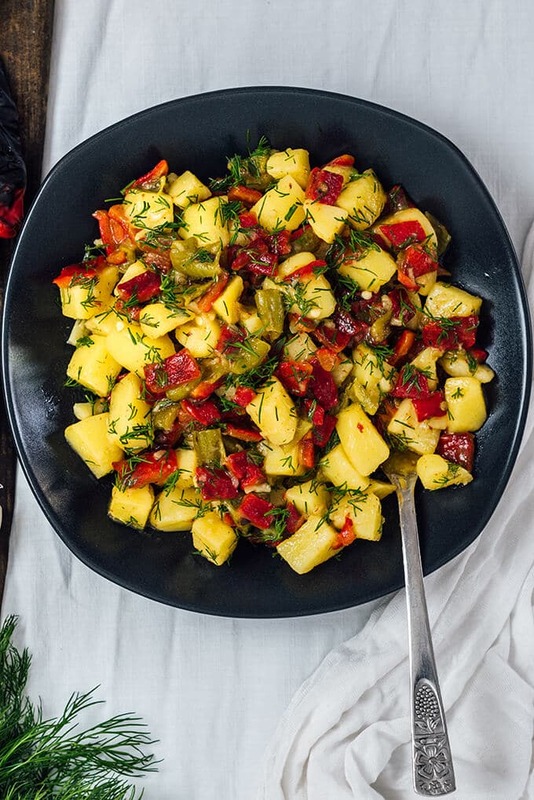 Instead of adding these one by one, I prepared a simple dressing so that potatoes and peppers were perfectly coated with the appetizing flavor. To prepare the dressing in a small bowl, whisk together lemon juice, olive oil, mashed garlic and salt. I used only one clove of garlic because I didn’t want a strong taste of it. Pour it over the salad and stir. So I took a small bite and it was AWESOME! Believe it or not, I couldn’t stop myself and finished up one third of it before my husband could shoot these photos. I was so proud of myself because I created this recipe myself. Would it be okay if I feel like an inventor? Why not? I mean this is so good! This recipe is perfect for those who don’t like mayo and what’s more it’s vegan. You do LOVE mayo? You are not vegan? 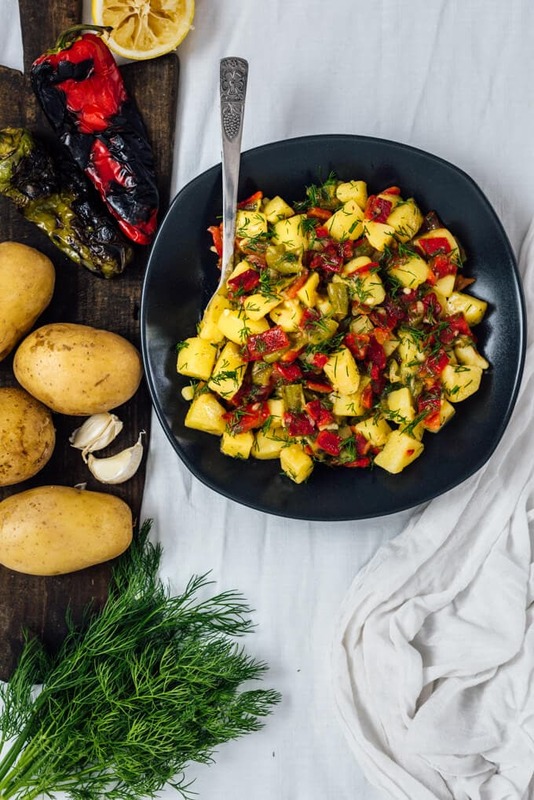 Still you HAVE TO try this potato salad! I guarantee this recipe is for everyone. Make sure the cooked potatoes and roasted peppers cool before tossing the salad. The salad is even better when chilled. Don’t forget to cover it before putting it in the fridge. Since the salad has garlicky dressing, I suggest keeping the leftovers up to two days. I’m sure there will be no leftovers though. I love fresh dill, so I use it almost everywhere. You can use whatever herb you have on hand. Put potatoes in a large pot and cover with water. Add in 1 teaspoon salt and bring it to boil. Then let it simmer for 20-30 minutes or until potatoes are tender. Test it with a fork. Don’t overcook or the potatoes get too soft. Meanwhile roast the peppers either in the oven or on the stove. To remove their skin easily, place them in a pot and cover with the lid. Let them sit for 5-10 minutes and then remove their skin. Drain the potatoes and pour cold water over them. Let them sit until they are cool enough to peel. Remove their skin and put aside. Cut the peeled potatoes in cubes and put them in a bowl. Chop the roasted bell peppers and add in the bowl with the chopped fresh dill. For the dressing, whisk all ingredients or shake them in a small jar and drizzle it over the salad. Stir well and serve. Great idea for the potato salad maybe I’ll prepare this as a side dish with our salmon for supper. p.s. I also prepare something a bit similar with cubes of carrots, potatoes, sweet peppers and onions with olive oil, lemon juice and herbs and roast in the oven. Pairing this salad with salmon is a brilliant idea! Thank you for your contribution to the recipe. Your version sounds even tastier. Will have to try it.